The papers and proceedings from the conference Making Futures IV, held in Plymouth, UK in September 2015 are online and available through their journal archive. 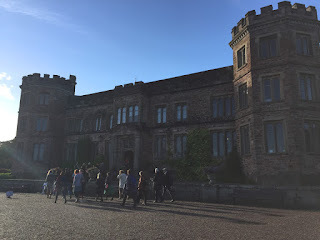 Hosted at the beautiful Mount Edgcumbe House, this conference addressed what it means to make and how significant making and craft may be in the future. Topics include: sustainability in practice; craft in an expanded field; critical perspective on producers and consumers; translations across global divides; materials and processes of making; and making thinking - craft education. My paper, Craft beyond craft: the transformative potential of craft's resilience, explores the notion of 'resilience' and its relationship to craft's transformative agency. In the face of recent environmental, socio-economic and political crises, there is growing doubt in the capacity of the neoliberal economic system in delivering ways of living that are equitable and ‘sustain-able. During this time of increasing uncertainty, in many western countries, craft has enjoyed a period of renaissance. The ideological connections of craft with eco-living and other grassroots movements; accessibility of its processes; and its defiant history have made craft attractive to a diversity of amateur and professional practitioners, and its practices have become representative of the emerging counterculture to capitalist hegemony. Its current popularity should be celebrated but to ensure its longevity craft cannot rely on a possibly fleeting status as an alternative to mainstream practices. Given its continued presence throughout history, it is likely that craft will persist. But in what form? This paper argues for an expanded and more permanent role for craft that contributes to ‘sustain-able’ futures, and for focus to be returned to craft’s strengths – namely its diversity and persistence – in order to develop this capacity. This paper proposes that in order to imagine these futures for craft practice it is necessary to explore the potential of plural economies in delivering ‘sustain-able’ ways of living. It explores the notion of ‘resilience’ and its relationship to possible transformative agency that can encourage and support ‘sustain-able’ practices.